A "rarely seen" Victorian interactive children's book which reproduces animal noises is to go on display following an academic conference on picture books. The Speaking Picture Book was published in 1893 and replicated nine sounds. Cambridge University's Professor Maria Nikolayevna said picture books are a "misunderstood" genre, yet have been around for up to 200 years. The 1855 Dogs' Dinner Party, which includes dogs moved by tabs, will also be in the Homerton College exhibition. Prof Nikolayevna said: "We have pop-up books, we have press the button books - interactive picture books have been around for quite a long time." 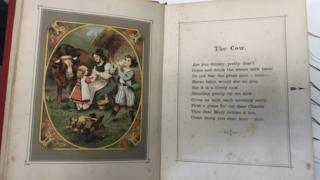 The "very rare" Speaking Picture Book has only recently been acquired by Homerton College Library - there is another copy at Cambridge University Library, but with fewer surviving sounds. Prof Nikolayevna said the study of picture books had come of age and they "are not books for pre-literate children - many are complex and demanding". "Twenty years ago, it would be absolutely unheard of that a doctoral student would be able to do research on picture books which were seen as kiddie books," she said. She added neuroscience has revealed children have an evolutionarily conditioned ability to use both hemispheres of the brain to understand and combine words and pictures. Prof Nikolajeva said: "As adults, we lose the skills... but as educators we should try to retain and develop these skills and this is what international picture book scholarship is doing." Over 120 scholars from 20 countries have attended the Cambridge Children's Literature Research Centre-organised conference. "Rare" first editions of classics such as Beatrix Potter's The Tale of Peter Rabbit, Now We Are Six by AA Milne and Kate Greenaway's Marigold Garden will also be included in the exhibition. The public can visit it as part of Open Cambridge on 15 September.